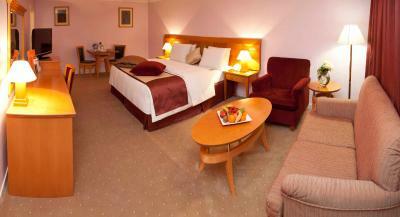 Lock in a great price for Petra Guest House Hotel - rated 8.6 by recent guests. The location was excellent and good to be close to the entrance to Petra after a long day of walking. We had a lovely balcony which was excellent to sit out and enjoy the evening. Great location - extremely close to the ticket office and the entrance to the site. The rooms were comfortable and clean - the wi-fi a little difficult at times - but this was true for a number of hotels in Jordan. Initially had a difficulty with the air conditioning - the hotel reluctant to turn it on - but we overcame this problem. Staff extremely friendly and helpful. The breakfast was basic but good enough to get you through the morning. 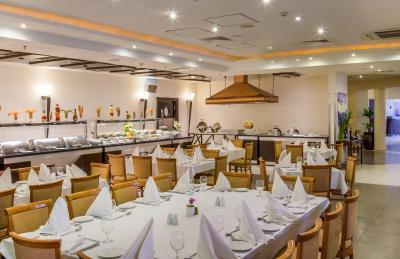 Limited a la carte dining - not keen myself on buffet arrangements - the hotel more focused to tour groups in this respect - but this is true for many Petra hotels. Location!! Location! Right outside the entrance to Petra. 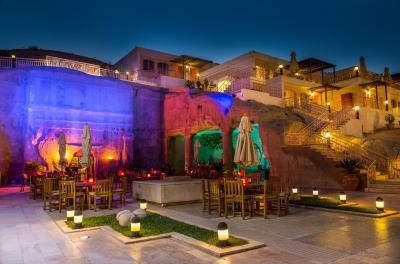 Plus the 2000 year old Cave Bar is so cool! 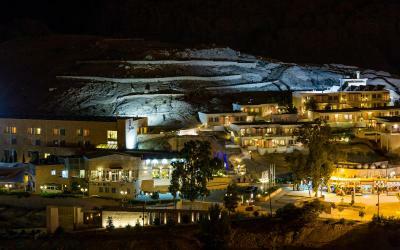 There is not a single better location to Petra than this hotel. Right by the entrance. Great breakfast options, friendly staff, big room. 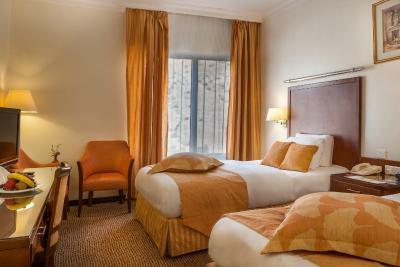 Large room, nicely furnished and big bed. Excellent location right by Petra main entrance. Very friendly at checkin. Porter who took bags from car to the room excellent. Very friendly place to stay. Triple room was big enough for the four of us staying and the extra mattress on the floor helped. WiFi connection is good. Amazing location and great to be at the entrance gates. Especially at the end of the day after 8 hrs of walking! The food was fantasic and the staff very helpful. the rooms well furnished and very clean. Prime location, right at the gates of Petra. The restaurant serves daily breakfast. 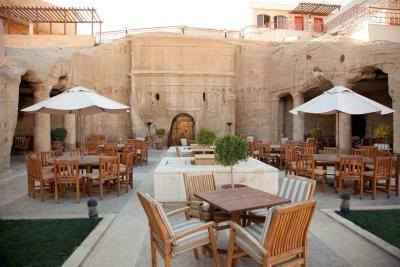 The Cave Bar, set in a restored 1st century Nabatean house, features Arabic and European specialities in an al fresco setting. The bar also serves cocktails each evening. 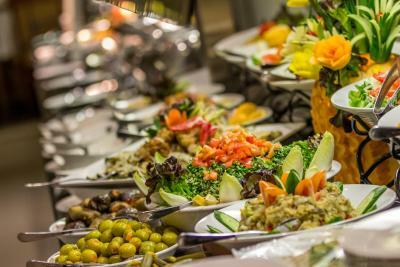 Guests receive a discount when dining at the restaurant. Aqaba King Hussein International Airport is 77.7 miles away. Guests can reach Amman Airport with a 3 hours' drive. 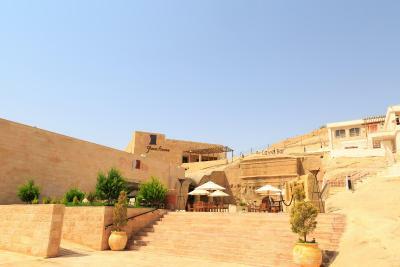 This property also has one of the best-rated locations in Wadi Musa! Guests are happier about it compared to other properties in the area. 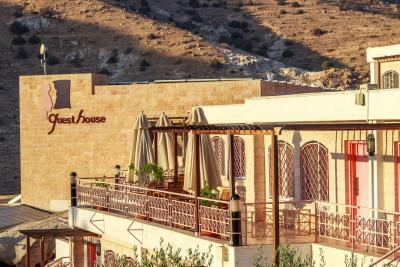 Petra Guest House Hotel has been welcoming Booking.com guests since 14 Jul 2010. 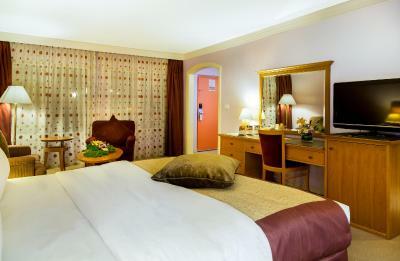 When would you like to stay at Petra Guest House Hotel? 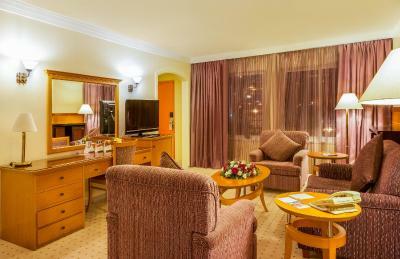 This spacious, air-conditioned room features views of the Wadi Musa mountains and is decorated in warm colours. It includes a seating area with a flat-screen satellite TV and a laptop safe. 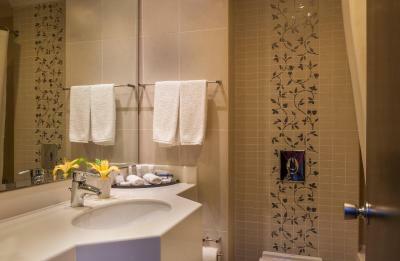 Each has a private bathroom with bathrobes, slippers, and free toiletries. The room has either a large double or a double bed. 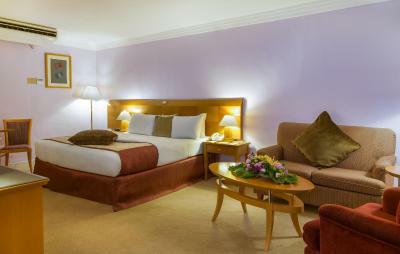 This spacious, air-conditioned room features a balcony with views of the Wadi Musa mountains and is decorated in warm colours. It has 2 single beds or 1 large double. Please note the room has 3 single beds and cannot accommodate an extra bed. 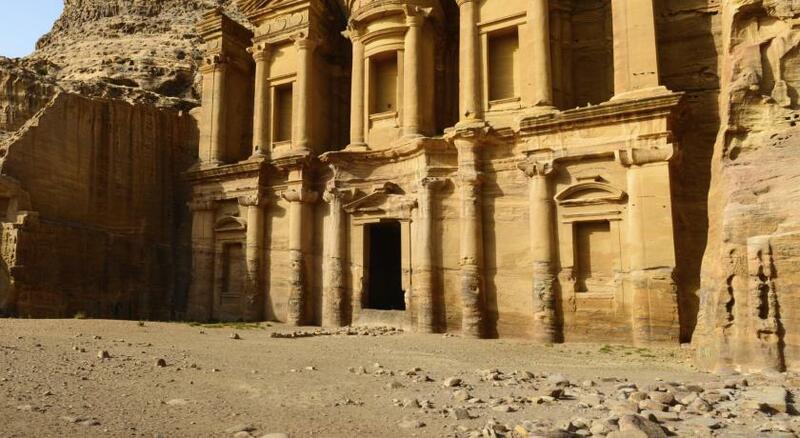 Immerse yourself in Petra's ancient landscape from the moment you arrive at the The Four Star Petra Guest House Hotel is located right at the visitor's entrance to the Siq with only steps away from the famous archaeological sites. Enjoy the spectacular views of the mountains from our 41 well appointed guestrooms and 31 chalets tucked in stones. All of our welcoming guestrooms have mountain views and all are fully equipped with modern amenities any traveler will need from LCD TVs, safe box, mini-bar, Ironing board, Coffee/Tea Making facilities and much more. 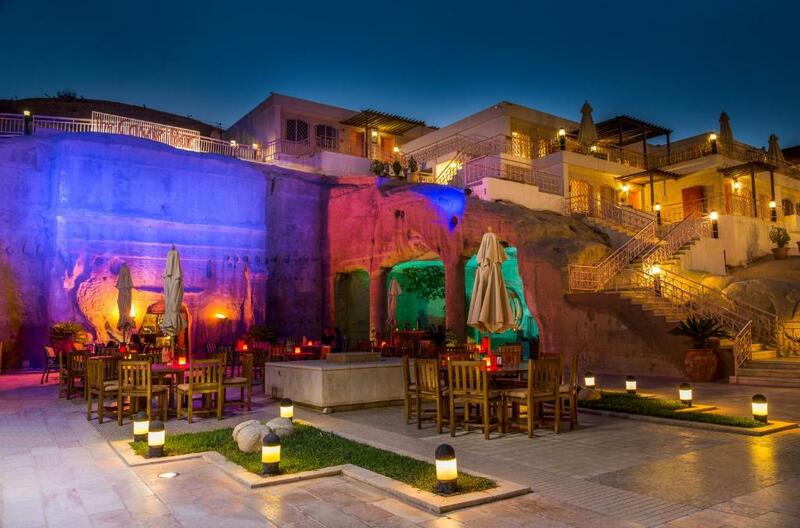 The Petra Guest House Hotel offers 1 lobby lounge, 1 main dining restaurant and 1 original Nabatean bar surrounded with a large Piazza. 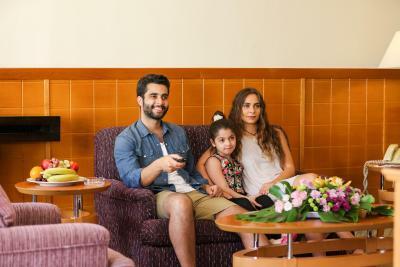 Also you can stay connected with your friends and family through our WIFI internet access. House rules Petra Guest House Hotel takes special requests - add in the next step! 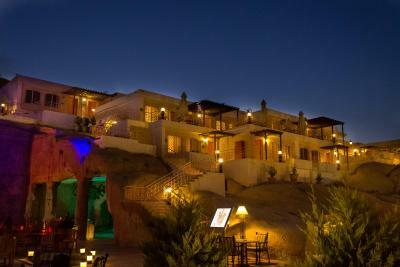 Petra Guest House Hotel accepts these cards and reserves the right to temporarily hold an amount prior to arrival. 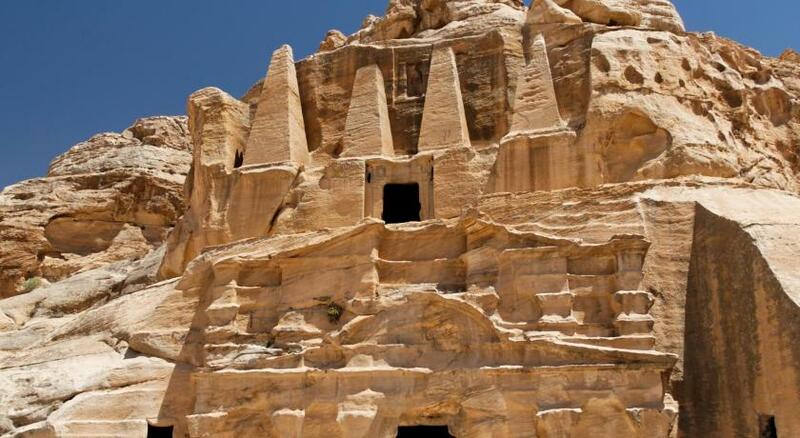 Some nationalities can get an entry permit stamped in their passport upon arrival to Jordan. Please check your visa requirements before travelling. Waiter service in the Cave Bar patio area outside. Breakfast room very hot. Terrible service - they go out of their way to be rude. At 11:15pm they said the bar is closed (bar closes at midnight). They would not serve us. So we had our own wine and we asked for 3 wine glasses - the server angrily stormed off and - misunderstanding us- brought 3 glasses of awful wine (didn’t ask what we wanted, red, white, brand, nothing). 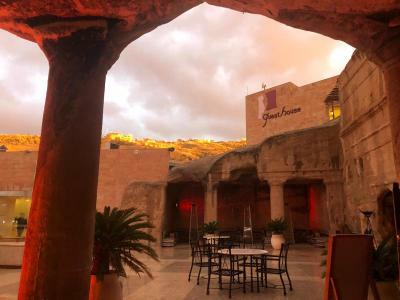 We wanted to enjoy a dink in the famed cave bar and instead we were poorly treated. Next morning at breakfast, no one greets you as you walk in the restaurant. We figured out where to sit. Omlette guy was alone and working 2 stations - 1 woman in front of me and it took 10 min to get eggs. There weren’t enough coffee cups, no cream, no sugar, no butter and no help. I asked for butter, waiter says vaguely waves hand “ On the buffet.” I asked one of the waiters - who was standing next to the manager and 2 other waiters for some service - no coffee cups, etc and he RAISED his voice and pointed to some glasses - which I didn’t need - and “You get your own glass! !” The manager said nothing, the other waiters shrugged their shoulders and went back to the important job of napkin folding. We had to scrounge off the other tables for sugar, cream and a cup - they would not give it to us. I spoke to the manager who apologized but the opportunity to have a good experience was gone. The bed was sagging a bit in the middle and the food at the Cave Bar was quite expensive. 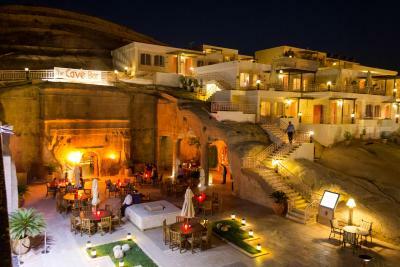 However, most restaurants in Petra were similarly priced and the food at the Cave Bar was tasty. Todo perfecto. El más cercano a la entrada a petra.. what else can you ask for??? Room was older and smelled like smoke in a non-smoking room, but had all of the necessary amenities. Rooms we stayed were so high to climb many stairs. Hot water pressure was very weak to shower. The location was insane! The cave bar and food were spectacular!